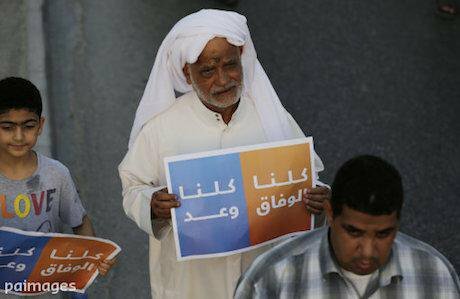 Bahraini anti-government protesters carry posters reading, "we are all Al-Wefaq, we are all Wa'ad. "Hasan Jamali/Press Association Images. All rights reserved.A democratic society is one that favours liberty, freedom of speech and religion, and equal rights and accepts the views and aspirations of individuals and minority groups. Recent Bahraini legislation has amended the law on political societies to cement the principles of pluralism, tolerance and political liberalism into Bahraini society. The legislation aspires towards a democratic society that corresponds with the principles affirmed in international human rights benchmarks, namely, the Universal Declaration of Human Rights, the International Covenant on Civil and Political Rights and numerous judgments of the European Court of Human Rights. These amendments also prohibit leading members of political societies from giving religious speeches, sermons and guidance. This prohibition is perhaps the most significant step towards democracy in Bahrain's contemporary political history, and especially welcome in the post-Bahrain Independent Commission of Inquiry (BICI) period. Could this represent Bahrain’s exit from the clutches of 'neomedievalism', if the new law clearly prevents political societies from manipulating Islamic values in order to achieve narrow and badly reasoned goals. The structure of some Islamist political societies in Bahrain cannot be compared to any modern, sophisticated and productive political group. The model of Hezbollah and other Iranian proxies in the Middle East cannot result in the creation of a democratic society. The Iraqi example could be at best be described as a “miscarriage of democracy”, precisely because of the involvement of intolerant religious actors in decision-making. Such individuals are not accountable to anyone within or beyond the structure of registered political groups, because of their strong belief that theocracy is the final aim justifying the manipulation of free and fair elections, and that democracy is no more than a set of procedures to be used to abolish the democratic system. It is clear from the mixture of religion and politics that the final objective is to replace democracy with a moral system inconsistent with the political evolution of mankind. This was the case with Wefaq, which was established in light of the political reforms issued by King Hamad bin Isa Al-Khalifa at the dawn of the century. The practice of Wefaq was not only inconsistent with democracy; it was seen by its members and spiritual clerics as a means to abolish the democratic system. This was evident in 2011, when they walked out of parliament, and openly supported the Iran-sponsored sectarian movement at the GCC Roundabout. Wefaq rejected all dialogue initiatives by the Bahraini government and NGOs, due to a clear ideological favoritism towards an Iran-styled theocracy, insisting that its comprehensive conception of the good (Wilayat al-Faqih) cannot be compromised. Wefaq’s suspension by a Bahraini Court in July 2016 should be seen as a first executive step towards the establishment of a democratic society in Bahrain. The exclusion of such an intolerant actor is necessary to create an overlapping national consensus, based on the pillars of substantive democracy, which reach beyond the limitations of the procedure of free and fair elections. Bahrain must not be held to ransom by narrow intolerant interpretations of Islam, and the time has surely come to liberate political reforms from those who believe they alone have a monopoly over the beliefs, thoughts and the ambitions of the electorate.